Take the test online right away! Pick up your permit when you pass! Take the Florida Permit Test Online Now! Can't wait to start driving? Take the required Florida permit test online right away, so you can earn your learners license and get on the road as soon as possible! 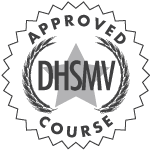 DriversEd.com is a DHSMV-approved provider of the online learners permit test. With our convenient online test, you can skip a trip to the DMV office. Just take the online Florida permit test anytime—no appointments, no lines, no waiting needed. Before you can earn a Florida license, you need to pass the Florida DHSMV permit test. Save time and take it online! DriversEd.com provides the Florida permit test, approved by the DHSMV, for teens 15 to 18 years old. Once you've signed up and paid, you can take the test online whenever you're ready. You'll need a parent or guardian nearby to proctor the test (that just means they have to watch you while you take the test). The Florida learners permit test has 50 questions. You need to get 80% to pass. Don't worry—we'll give you 50 free practice permit tests, so you have plenty of chances to prepare before you take the real thing. After you pass the Florida permit test, we'll notify the DHSMV. Then all you have to do is go pick up your learners permit from the nearest Florida DMV office! Make sure you take all the required documents with you.